THANK YOU FOR VISITING LUMA! Our business idea: With a flexible and service-orientated organization develop, produce and provide global markets with high-quality precision wire with focus on long term business relationships characterized by high technology and niche needs. In Luma´s ”micro(n)world” everything starts with the customer. Creating long-lasting ”sustainable” customer relationships lies in the nature of our business because it often takes a long time to create products according to our customers demands. Thus we want to be the natural choice partner No1 for our customers in development of innovative solutions within the Fine and uUtra Fine Wire (UFW) sector. office and production plant in Kalmar, Sweden. 80 years of experience in fine wire drawing and gold plating of ultra fine wire. We offer very thin wires but still with a high strength. Our thin wires are also available as gold plated. We develop our own thin wire manufacturing processes and also design our own equipment to secure that we are able to meet our customers’ demands for thin wire products. Luma provides services like material analysis and plating on wire materials. Custom plating service for several types of substrate metal wire. A well equipped laboratory for material analysis. Through our technical service team we help our customers to solve problems. We also participate in customer developments of suitable fine wires. 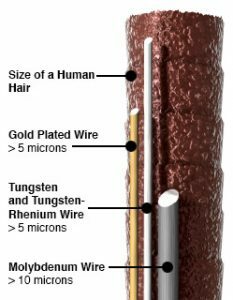 Luma can supply wires of any dimensions, although we currently specialize in fine and super fine Tungsten and Tungsten/Rhenium wires down to 4 microns. Gold plated wires of various dimensions are another current specialty. Through our technical service team we help our customers to solve their problems. We also participate in customer development projects.